Product prices and availability are accurate as of 2019-03-28 20:01:08 EDT and are subject to change. Any price and availability information displayed on http://www.amazon.com/ at the time of purchase will apply to the purchase of this product. This Video Transceiver with Power is a passive (non-amplified) device that allows the transmission of real-time monochrome or color video over Unshielded Twisted-Pair(UTP)telephone wire. Baseband (composite) signals of any type are supported. 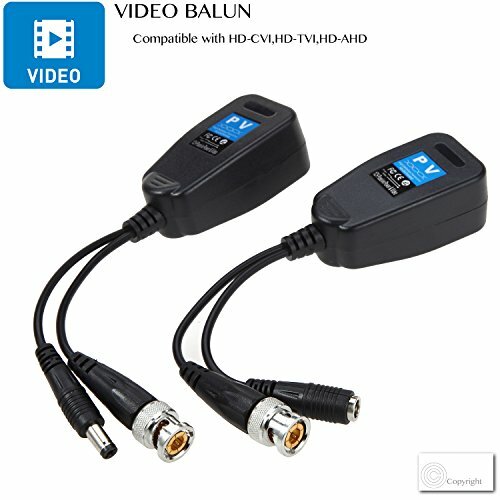 This video transceiver allows transmission of CCTV video and low voltage power over UTP cable.Power and Video are routed via UTP and RJ45 connections. Its unparalleled interference rejection and low emissions allows video signals to co-exist in the same wire bundle as telephone, datacom, or low-voltage power circuits. This allows the use of a shared or existing cable plant. 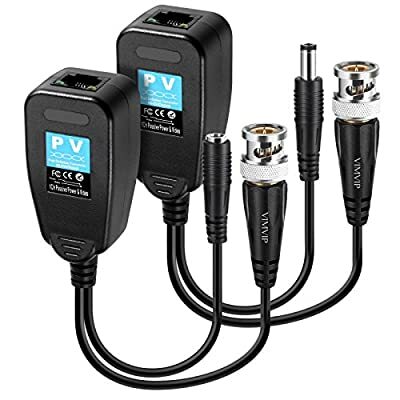 * Compatible with all HD-CVI,HD-TVI,HD-AHD. * Video up to 450m for 720P CVI cameras. * Video up to 250m for 1080P CVI cameras. 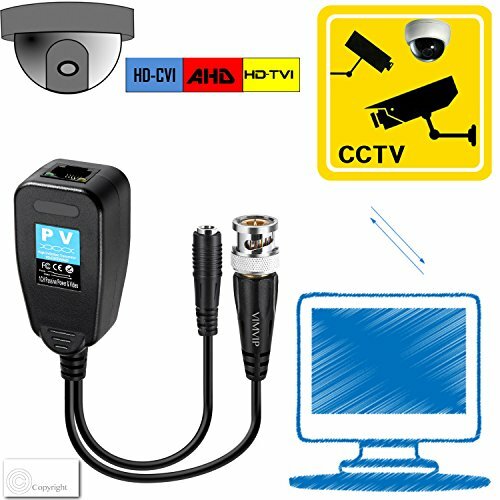 * Video up to 250m for 720P/1080P TVI cameras. * Video up to 320m for 720P AHD cameras. * NTSC,PAL,AND SECAM video formats. * 60db crosstalk and noise immunity. * Compact size and easy installation. * Built-in transient suppression protection. 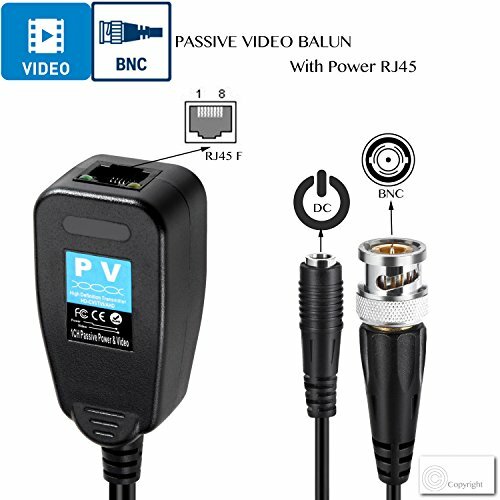 Power & Video Balun:Gold Plated BNC is provided with better transmission quality and long distance HD transmiter. 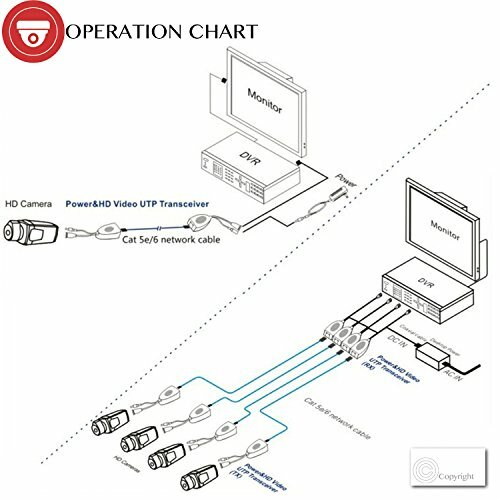 Super Extensive Applications:Support all video devices, such as camera, monitor, DVR card and recorder etc.Compatible with all digital CVI, TVI and AHD Cameras. Video transmission Via UTP CAT5:LED indicate whether working (green light) or not working(yellow light) by RJ45. Easy to install:We provide a specification which has detailed installation steps make the procession of installation simple and convenient. 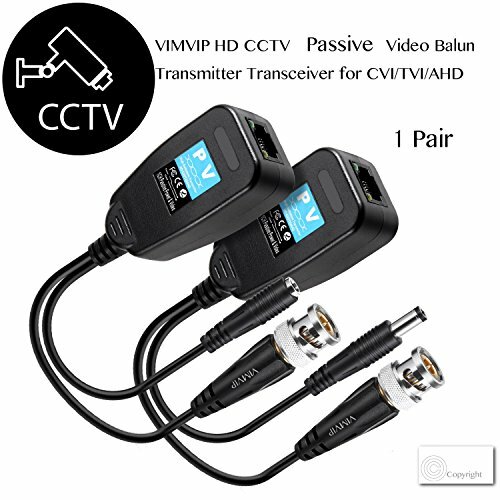 Package Include:1 Pair VIMVIP HD CCTV CVI/TVI/AHD Video Balun+Installation Specification+1 Year Friendly of Warranty Service.